Accessorize in style with these elegant earrings adding a touch of sparkle to complete a stylish look. Inspired by the timeless elegance of Princess Grace of Monaco this bracelet will allow you to express your femininity through its classic refined design. 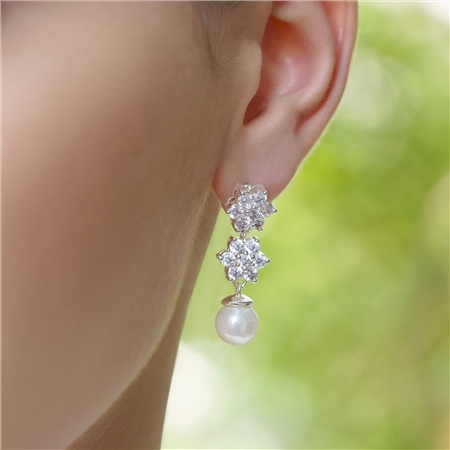 Vintage style silver plated earrings with a protective anti tarnish layer, clear Cubic Zirconia stone settings plus a 6mm drop faux pearl setting, titanium posts, butterfly backs, presented in a Newbridge Silverware Princess Grace collection gift box. 35mm in length. For hygiene reasons earrings cannot be exchanged.